St. Augustine Lighthouse is on Anastasia Island between downtown St. Augustine and the Atlantic Ocean. It overlooks the Atlantic Ocean, Salt Run, and St. Augustine Inlet. The lighthouse was built on the site of an old Spanish watchtower dating back to the late 1500s. The current lighthouse was built in 1874. In 1876, a brick lighthouse keeper's house was built on the site. The lighthouse is 165 feet above sea level and contains 219 steps to the top viewing platform. The light is still lit today, but has been downgraded from the giant Fresnel lens of old to a 1000 watt bulb. The light is still a pleasant addition to the St. Augustine skyline. The lighthouse and museum are operated by a non-profit volunteer organization, the St. Augustine Lighthouse and Museum, Inc. This organization provides a wide variety of educational programs to school children, and coordinates the visits of the many tourists who come each year. Their education mission is stated on their website as "to discover preserve, present and keep alive the stories of the Nation's Oldest Port as symbolized by our working St. Augustine Lighthouse." There are guided tours and interactive programs that are included with your general admission tickets. If you are less than 44 inches tall, admission is free! You can walk up the 219 steps to the top of the lighthouse and see a breathtaking view of St. Augustine, the Atlantic Ocean and Beach, and Salt Run with its anchorage of boats. 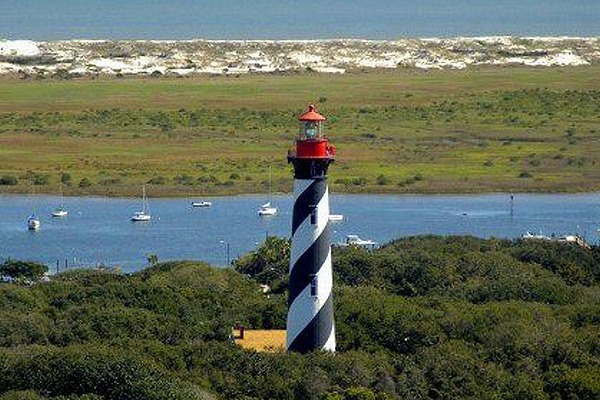 The St. Augustine Lighthouse and Maritime Museum website has further details about the lighhouse and museum. 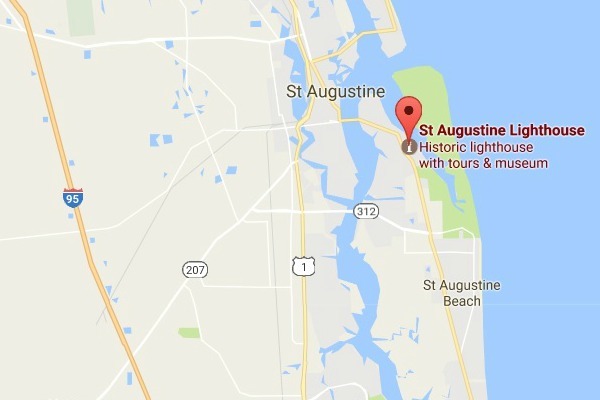 There is also information on St. Augustine on our website at St. Augustine, Florida.